The mainstream media and the Democratic party are always referring to Islam as the religion of peace, and yet time and time again an extremist carries out attacks against innocent people in the name of Allah. In New York, a different display of the peaceful religion was shown but it is unsettling nonetheless. It all started when a FedEx truck bumped into a mourner outside of a mosque. The ensuing minutes would be a bloody battle. Instead of waiting for authorities and making a report like normal people would do, an enormous mob emerging from the Mosque located near Sixth Ave. and 63rd St. in Sunset Park began surrounding the truck. The initial victim was a 46-year-old man who had just attended a funeral at the Beit El-Maqdis Islamic Center of Bay Ridge. A board member of the mosque named Naim Jawad claimed the driver of the truck had "road rage" due to the 70-100 people exiting the mosque blocking the road. "The gentleman lay on the floor because he couldn’t move until the ambulance came," Jawad said. "I don’t think they knew they hit the guy or not until our guys stopped them." When nearby witnesses saw the man on the ground they became angry. "They tried to hold the FedEx truck so it doesn’t go anywhere," Jawad added. That is when things got violent and bloody. "They started swinging and punching each other," Jawad said. The FedEx truck itself is a testament to the melee that ensued as the truck's side windows were all smashed. The driver of the FedEx truck was identified as 25-year-old Andrew Blunt and used a box cutter to defend himself. He was later accused of slashing a 46-year-old man on the hand with a box cutter. The other FedEx worker was Blent's coworker, 25-year-old Omar Lindsay who used a fire extinguisher to defend himself and bashed a 52-year-old man in the head. Of the FedEx workers was overwhelmed and assaulted in the fray by the 23-year-old nephew of the man whose funeral had just concluded. 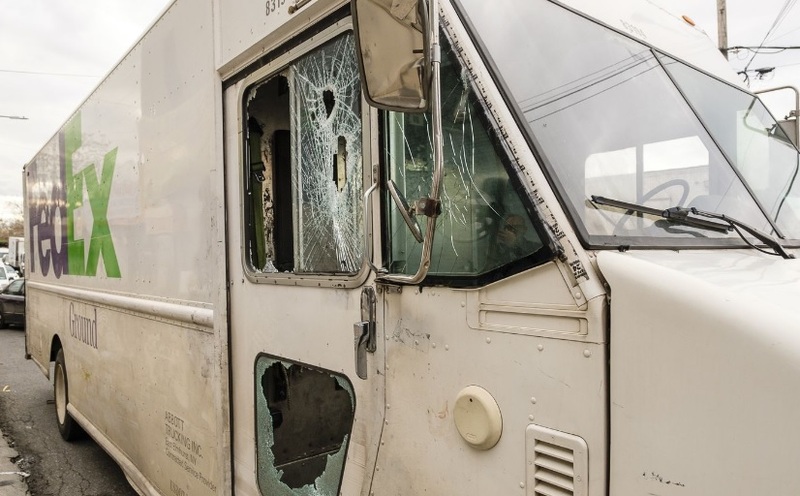 Quadus and two FedEx workers were caught, while a third FedEx worker managed to escape. Quadus has been charged with misdemeanor assault and the two FedEx workers were charged with Felony assault. That is very interesting to me, the working men, the men with jobs receive higher charges then the Muslim, despite defending themselves when they were vastly outnumbered. Even the mosque's board member admits they began swinging and punching the workers. One Twitter user wrote, "This is Gang assault and the fact that u will not say who escalated this is disgust any other religion would be okay." The mother of the FedEx worker named Omar Lindsay said she was shocked by the news of the fight. "We haven’t gotten a call from him, we haven’t heard anything. He just went to work this morning and that’s it," Lindsay told the Daily News. "He doesn't do things like that." This doesn't sound like a violent individual yet he was charged felony assault when attacked by a crowd of Muslims. The workers and the Muslim assailants were treated for their injuries at NYU Langone Hospital-Brooklyn. Naturally, FedEx distanced themselves from the situation calling it "disturbing" and said it is "cooperating with investigating authorities to determine the facts." I guess we will have to let the courts figure this mess out but it seems like a case of an accident, followed by an attack, followed by self-defense based on what the mosque's board member said. The Fedex drivers were attacked by a mob of muslim terrorists. The window of the Fedex truck was broken in an attempt to break into the truck and attack the Fedex drivers. The police were obviously motivated in favor of the muslims and did not care about justice. It should be understood that by allowing these muslim terrorists to enter the US we have a dangerous and violent cult of killers roaming our streets. These muslims will never assimilate into American society. Their goal is to take over and destroy all non muslims. Our government through law enforcement will attempt to blame all confrontations between muslims and Americans on Americans and will attack Americans who are simply defending themselves from the muslim hordes. All muslims should be deported back to the middle east, they are unfit to be Americans! Indeed, the endgame of these heathens is complete subjugation. We must cast them all out, before they do so to us. They are the enemy, as are those who would protect such barbarians. Mob mentality in a New York second and it is excused while they arrest those that tried to defend themselves from said mob. Outrageous! Bad peeps already hate the cops but... Pulling sheit like this & the cops will have good people leery & wary of them as well. I live in sunset park bklyn and this is not the first time members of this mosque attacked some one in a gang. Until law enforcement decides to do their job and start arresting criminals, These reprobates that attend this mosque will continue to behave asinine. I hope Fed Ex, and those three men who were attacked SUE the hell out of that mosque and the NYPD for areesting them under false pretense.